Travel website TripAdvisor has awarded its Certificate of Excellence for 2017 to Gold Hill Museum. 61% of nearly 200 contributors to the website rated the Museum as “excellent” while the average score was 4.5 out of 5. 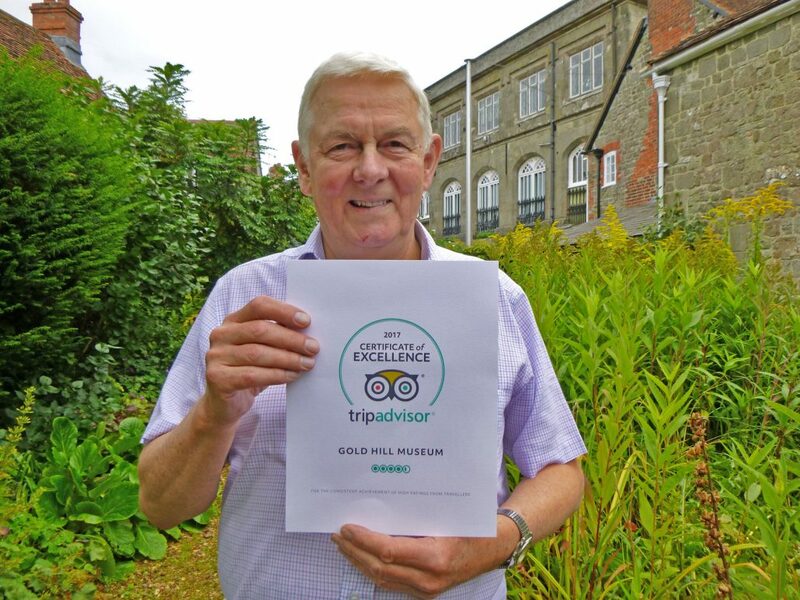 The most recent reviewers enthused about a “brilliant MUST VISIT museum with FREE entry.” Chairman David Silverside, pictured in the Museum Garden with Certificate, was “exceptionally proud that the dedicated work of our 60 volunteers has been recognised. The Museum offers something to interest all ages – film footage of D Day tanks rolling along Shaftesbury High Street, Dorset’s oldest fire engine, and photographs and paintings showing how the town’s appearance has altered.” Shaftesbury’s top tourist attraction, according to TripAdvisor, is open daily 10.30a.m. to 4.30p.m. until 31 October.